All lunch meal deals include chips and a can of drink. 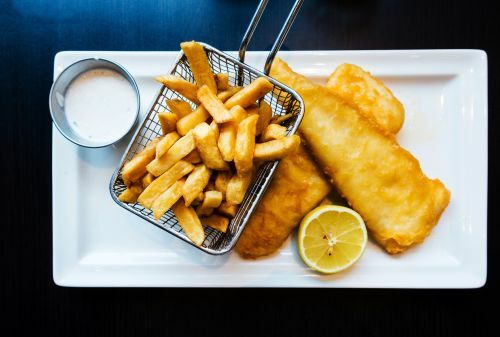 Fish, chips and 600ml drink. Hamburger, chips and 600ml drink. Fish burger, chips and 600ml drink. Chicken Schnitzel Burger, chips and 600ml drink. Steak Burger, chips and 600ml drink. All served with fresh salad, chips, tartare sauce and lemon. Comes with free soft drink. All burgers come with lettuce, tomato, onion and beetroot. Nuggets (6 pcs) and chips. Potato scallop, dim sim, seafood stick, calamari and chips.